The cool folks over at Toronto ad agency Red Urban are consistently hitting home runs with their work for Volkswagen Canada. 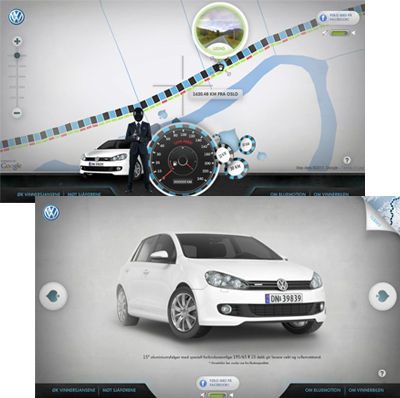 Just last week I published a post about their augmented reality experience for the 2012 Beetle. The latest is the ‘Great Volkswagen Art Heist’, a bold experiential campaign unleashed across Canada for the launch of the 2012 Jetta GLI. A few months ago Red Urban introduced the 2012 VW Jetta GLI with a TV commercial directed by Hubert Davis of Untitled Films. The shoot used a combination of traditional and long exposure videography to pain light trails using the headlights and taillights of a Jetta GLI. 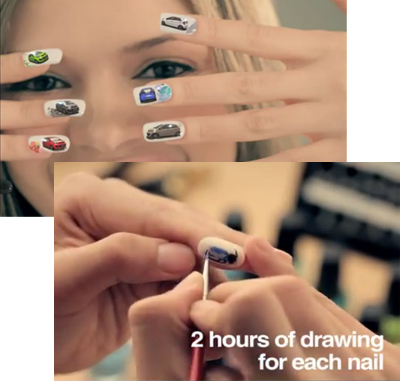 To see how they created the ‘Driving Beautiful’ ad check out the great ‘making of’ video. Last week Volkswagen Canada began to reveal pop-up street galleries in Montreal, Toronto and Vancouver where the public could find (and take) framed prints of the photography from the commercial shoot. The would-be thieves have been asked to post their ‘hot art’ in an album on the Volkswagen Canada page. Follow the Volkswagen Canada Twitter page for next week’s locations. I can’t wait to see the ‘Making of…’ version of this ad. The Toyota Prius family has expanded for 2012 from the original one to include the smaller one, the bigger one, and the one that plugs in. I’ve heard of family members being clingy, but this is ridiculous. If it wasn’t for the awesomeness of hearing The Kinks ‘Got to Be Free’ in the background I’d still be reeling in the creepiness of this ad. Ad was created by Saatchi & Saatchi LA. To demonstrate just how far the new fuel-friendly Volkswagen Bluemotion Golf could travel on a single tank of glass, Norwegian agency Apt came up with the very creative idea. They decided to have two drivers head north from Oslo in the Golf using the road commonly known as the E6. The road was divided into 80,000 car-length roulette slots using Google Maps and Streetview. A TV commercial informed Norwegians to go to the site and select the section of road that they thought the car would run out of fuel on. The lucky person who chose the correct section on the roadway won the car. Pretty simple right? The whole drive was broadcasted live through the campaign website and 27 hours later the car finally came to a stop after driving 1527 kilometres north from Oslo. The Bluemotion Roulette site is simple and well designed, with all the important car specs that players could use to calculate how far the car might go. I love the idea of demonstrating the car’s fuel capabilities this way. The concept is very interactive, memorable and fun. 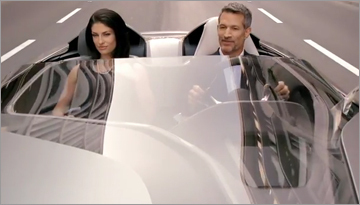 I’m reasonably sure that BMW is not endorsing criminal behavior with this tongue in cheek instructional video. But if you’ve chosen a life of crime you might as well do it with style in BMWs Vision ConnectedDrive concept car. The car was first unveiled back in March at the Geneva Auto Share as part research tool and a glimpse into the future of mobile networking. The 2011 version of ConnectedDrive technology combines driver assistance, online applications and integration of mobile devices and is available on all new BMWs. Some people have written that it’s ironic that Toyota has decided to use SpyderLynk’s SnapTag technology instead of QR codes. After-all it was the Toyota subsidiary Denso that first developed the QR Code in 1994 as a tracking system for their auto parts manufacturing business. That system, which came pre-installed on mobile phones in Japan soon became a widely used method to connect mobile users to online content. A Toyota spokesperson explains in the press release that they “sought a barcode technology to extend their marketing efforts and get ahead of the innovation curve.” They’ve gone as far to name the version of SnapTag as the ToyoTag, but even after reading the rest of the press release I’m not sure why they chose SnapTag over other 2D barcode technologies. I suspect it may come down to the ability for a SnapTag to fit in better with a company’s branding. The other reason could be that SnapTag includes alternative connection methods for users to access the online content via established services such as MMS and Email. The ToyoTag that you see here did not work for me. I have had the ScanTag iPhone app installed for some time and has worked fine on previous occasions. The ToyoTag scans correctly, but it ‘times out’ before it can access the mobile site. It maybe that the tag above may just be a sample and it not active on the SnapTag server right now. 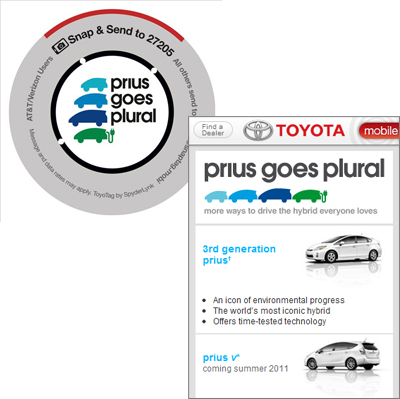 When I emailed a photo of the SnapTag to the email included on the graphic, I received an email back within just a few seconds that included a link to the Prius mobile website. SnapTag’s are also be used in the September issue of Glamour and I’ll be reviewing that later today. Nissan USA has launched a program featuring QR codes on window stickers of its entire 2012 lineup, starting with the Altima and Sentra models. 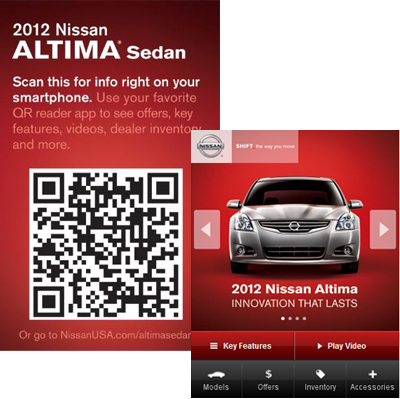 Car shoppers with smartphones can access a well designed mobile website by scanning the QR code. The website includes key features, images and a short video of each model. By sharing their current location through GPS or by entering their Zip Code, shoppers can instantly see current offers, inventory and request a quote from that dealership or one nearby. People often justifiably scoff at the use of QR codes these days as they have been misused more often than not, but I think this particular use makes sense. Shoppers who have already done research on their desktops want to see the cars in person. They may choose to browse a dealership by themselves, possible after hours while the dealership is closed (I’ve done this myself). Car shoppers can view the cars at their leisure without the intrusion of a salesperson. While some features, such as image gallery or videos make little sense in this scenario, good QR code scanning apps allow the URLs to be saved for later viewing. In the near future this type of enhanced shopping experience could be triggered by a scannable NFC chip located on the car, however, I think the use of image-recognition has more potential. A mobile app that can check any car photo against a database could serve as a trigger to access new product information, local dealers, etc. It would be a perfect idea for a company like AutoTrader. Someone sees a great looking car in a parking lot or parked on the street. The user captures the image with their mobile phone, the application checks against the database and displays if anyone or a dealership near your location is selling a car like that. I’m betting someone’s already working on that. On November 3, 1911 automotive engineer and racecar driver Louis Chevrolet cofounded the Chevrolet Motor Car Company. 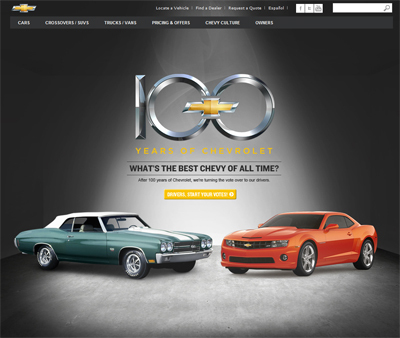 Now, 100 years later Chevrolet is set to celebrate it’s Centennial Anniversary including a digital program incorporating a microsite, Facebook and Pandora. The site Chevy100.com asks the question ‘What’s the Greatest Chevy of All-Time” and features a bracket showdown of 16 Chevrolet classics including several Corvettes, Camaro, and Impala. Even the Volt managed to sneak into the sweet sixteen in what must have been a special write-in nomination from the marketing department. The voting is done by using Facebook ‘Likes’ with each vote being shared back to the user’s profile. For those who are looking to find a party to celebrate the centennial with other car fans, the Chevrolet Facebook page features a searchable event calendar. If an event doesn’t exist in their area, a fan can create an event and add it to the calendar. UPDATE Sept 25, 2011: The eventual winner was the 1969 Camaro, visit the Chevy100 site to see how the bracket competition worked out in each round. 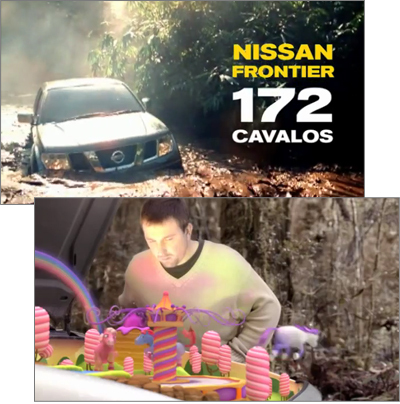 This Brazilian commercial for the Nissan Frontier may just win the award (if they have one) for the weirdest truck commercial ever. Thank goodness I don’t understand Portuguese, otherwise the first time I saw this ad I would have been far more freaked out than I was. In this ad for the Nissan Frontier pickup we watch an unlucky driver get his truck stuck in the mud. Frustrated, he yells out ‘Damned Ponies!! He opens the hood and we see that his truck is indeed powered by a trio of “pôneis malditos” (damn ponies) prancing happily on a merry-go-round. The ponies then sing their song “Damned ponies, damned ponies, come get stuck with us. I hate mud, I hate sludge… what a yuck!! I won’t get movin’.” Watch a version of the ad with subtitles. At the end of the video there is a link to www.maldicaodoponei.com.br, where visitors can send a curse to their friend or post a video of their own curses. Brazilians must be huge fans of curses or animated ponies as the original ad posted on YouTube features nearly 3.5 million views in the 4 days since July 29. 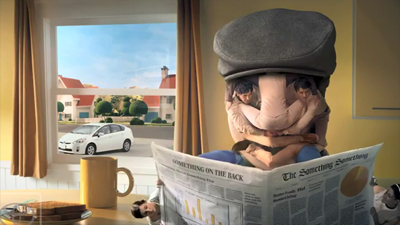 The ad was created by São Paulo agency Lew’LaraTBWA. Now all that’s left are the lawsuits from My Little Pony. Creating an animation from 900 hand painted fake fingernails may not be the first idea you come up with when you are promoting a car, but that’s just what Kia did when it came to creating buzz for their redesigned Picanto. Artists worked for 25 days and nights using 1200 bottle of nail polish and 900 fake nails to create this 40 second animation highlighting the key features of the car. Each nail took an average of two hours to complete and as you can see the results are impressive. Find out more about the Kia Picanto.